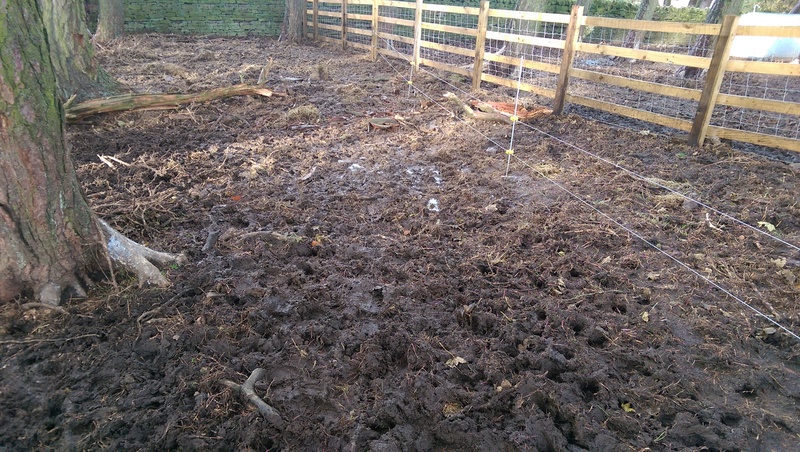 At long last the work to subdivide the larger, stock-fenced enclosure in the woods using electric fencing has been completed. The delays were solely down to my dithering because it’s all completely new to me and I didn’t want to get it wrong on my first attempt. 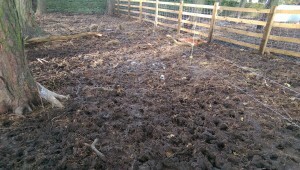 In the end I had to simply get on with the job and the pigs will have to put up with the fact that the end results don’t look very professional. Most importantly it works which is the main thing and I have yet to get a blast from it but that may only be a question of time. The real push for this was because the weather has been unreasonably wet lately which meant that the pigs were close to needing water wings at times. 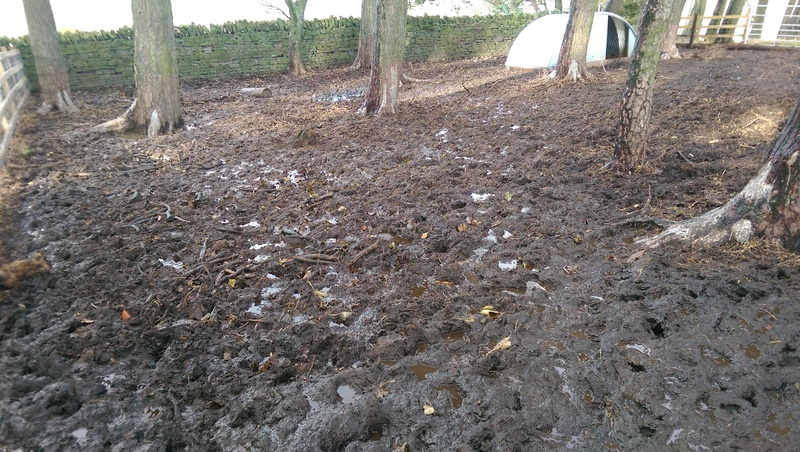 What had started out as a beautiful pen on a gently sloping, grassy bank in the woods has now become a quagmire in need of a few days of better weather before it can even start to dry out. Even the next door pen which was regularly used as a daytime play area was beginning to suffer from the wear and tear. 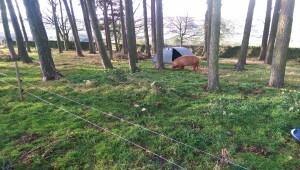 There really wasn’t any alternative if I wanted to keep them fit and healthy so the electric fencing jumped to the top of the priority jobs list. Luckily I was able to rig up a short length in this day pen so that I could get them used to the idea because they’ve never seen it before so I wanted to ease them in gently at first. As it turned out they’re fairly quick learners and it only took a few zaps before they started to give the fencing a wide berth. They are now happily ensconced in their new home with fresh straw in the ark and plenty of grass to root up in their spare time between feeds. They seem to be very well settled now and have electric fencing on two sides with a dry stone wall and some stock fencing on the other two sides. Another significant plus should be that future litters can be familiar with electric fencing before we sell them on to others as weaners for fattening up. 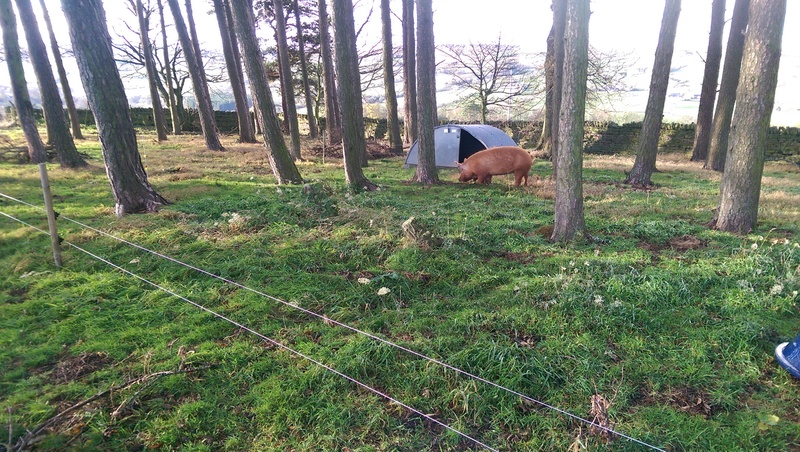 This will definitely helps the new owners because smaller pigs can easily panic and push through (or damage) an electric fence when first encountering it.